When we say the Trio is an allrounder we really mean it. Designed by Phil Morrison, with classic hull lines the Trio is thoroughly modern, but retains some well-proven features of older dinghies. At 15' the Trio has the length to give effortless performance, the ability to carry a large family, and to be quite steady and reassuring when the weather turns nasty! "Sit in" seats and a deep cockpit floor, combined with a relatively high boom make the Trio a superbly comfortable dinghy to sail. Alternatively, optional extras such as front and rear lockers, fendering, oars and outboard motor make the Trio a classy cruising dinghy. Quite a lot of Trios are working hard at sailing schools or are used as sailing club training dinghies, so they are built to be tough with strong "no-nonsense" fittings. Comet Dinghies no longer build the Trio. 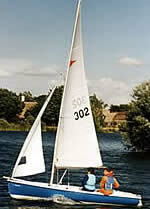 The new builder and supplier of all Trio spare parts is Peak Dinghy Spares Ltd.